Orbinaut is a Badnik that appears in more than one game. It's a hovering sphere surrounded by four spiked balls which rotate slowly and are used for both attack and defence, and is apparently based on a sea urchin (the Japanese word for sea urchin is "uni"). A redesigned Orbinaut appears in the 3D games, where it is called Unidus. Also, there is a Badnik similar to Orbinaut in the Sonic the Hedgehog 2 called Sol. In the Mega Drive version of Sonic the Hedgehog, there are two types of Orbinaut. The first appears in Labyrinth Zone, and is referred to as "Unidus" (ウニダス) in the Japanese manual.Media:Sonic1 MD JP manual.pdf "Unidus" is red in colour and launches its spikeballs along a horizontal line when Sonic approaches. 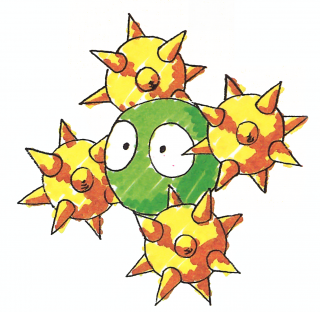 The second type is found in Star Light Zone, and is known as "Uni-Uni" (ウニウニ) in the Japanese manual.Media:Sonic1 MD JP manual.pdf It is green in colour and doesn't launch its spikeballs, making it less threatening but harder to destroy. An orange "Uni-Uni" also appears in the 8-bit version of Sonic the Hedgehog in Sky Base Zone. If you run away from the Unidus after it throws the first spike ball until it leaves from the screen, when you back to Unidus, all the other spike balls will disappear. An Orbinaut in Launch Base Zone. A third Orbinaut appears in Sonic the Hedgehog 3's Launch Base Zone and is referenced as Pola (ポーラ). This version is silver-grey and spins faster when Sonic is moving, but doesn't launch its spikeballs. It is similar to Uni-Uni in this regard. Orbinauts can now be quickly defeated with Sonic's new ability, the Insta-Shield. A similar enemy in IceCap Zone, Star Pointer, does launch its spikeballs, like Unidus, so both types of Orbinaut are covered in Sonic 3. Said spikeballs will be destroyed if they touch a Lightning Shield. Both types from the first Sonic game return in Sonic the Hedgehog 4: Episode I, found in Lost Labyrinth Zone. The Unidus behaves and looks the same as it does in the original game. The Uni-Uni, however, can expand its circle of spikeballs, making it easier to attack. The Badnik returns exclusively in the Nintendo DS version of Sonic Colours where only the Uni-Uni variant can be found in Planet Wisp, Aquarium Park and Asteroid Coaster. They look similar to how they did in Sonic the Hedgehog 4: Episode I, and appear both above ground and in underwater sections. Some Uni Unis block openings for the player to pass through while others move up and down. The best way to destroy them is by using Color Powers. Both types of Orbinauts appear as recurring enemies in both versions of Sonic Lost World. The Uni-Uni variants are found in Windy Hill Zones 1 and 2, Frozen Factory Zones 1 and 4, Silent Forest Zone 4 and Sky Road Zones 4 and ? in the Wii U/PC version. In the Nintendo 3DS version, they are found in Tropical Coast Zones 2 and 3, Frozen Factory Zones 1 and 3, and Sky Road Zone 1. In 2.5D sections in the Wii U/PC version, Uni-Unis hover back and forth in one place while their spiked balls orbit them laterally, but will drop their spike balls if approached by the player, leaving them vulnerable. In 3D sections and throughout the 3DS version, their spike balls orbit around them horizontally and they do not drop them. The Unidus variants are found in Frozen Factory Zone 4 and Sky Road Zones 1, 4 and ? in the Wii U/PC version, where their spike balls will orbit them laterally in 2.5D sections and horizontally in 3D sections. When they see Sonic, they will launch their spike balls at him one by one rather quickly. In the 3DS version, they appear exclusively in Sky Road Zone 2, where they do not attack Sonic and instead choose to hover about like their Uni-Uni cousins.